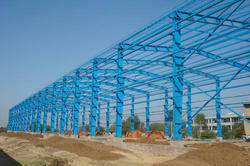 Leading Manufacturer of pre engineered buildings and purlins from Pune. We are expert providers of Pre Engineered Buildings. These buildings are tailor-made solutions to a customer’s needs and are custom-designed to meet exact requirements. These buildings are flexible enough to suit different building dimensions, they are easily expandable, can withstand harsh climatic conditions and come with maintenance-free exteriors. These pre-engineered buildings are suitable for both, industrial and commercial operations like warehouses, factories and cold storages. With the assistance of our diligent team of professionals, we have become competent enough to offer our esteemed clients with high quality c and z purlins at market leading prices. Used to provide lightweight, economical, efficient roofing and cladding support systems for framed structures. C-sections have equal flanges and may be used in single spans and unlapped continuous spans in multi-bay buildings. Z-sections feature one broad and one narrow flange allowing the two sections to fit together snugly, making them suitable for lapping. Looking for PEB Structure ?